The Galaxy Alpha versus the competition - how does it stack up? Apple has long argued for the merits of a smartphone you can use one-handed, that's why the iPhone 5S grew taller, but not wider. The idea of a scaled down flagship isn't alien to the big Android OEMs, but Sony is the only one so far to avoid scaling down the specs when it shrank the phone, which is why the Sony Xperia Z1 Compact is the current king of smaller Android smartphones. But wait, what's this? A premium design in a small body with cutting edge specs? Samsung has been listening and it's trying to blow away the compact competition, including its own Galaxy S5 Mini, with the Samsung Galaxy Alpha. Does it have what it takes to be the leader in the category of mini hyperphones? Let's take a look. Samsung is seriously excited about the design of the Galaxy Alpha. The fact that it's less than 7mm thick is impressive, but not a major surprise, what will raise eyebrows is the "high-quality metal frame and luxury look and feel." From the front it's clearly a member of the Galaxy family, but that metal frame is solid, not plastic, and the soft matte finish echoes the mottled patterning of the S5, but looks a touch classier. It measures 132.4 x 66.5 x 6.7mm and weighs just 114g. It's a tiny touch bigger than the S5 Mini which is 131.1 x 64.8 x 9.1mm and 120g, but much slimmer and slightly lighter, despite the new materials. The Xperia Z1 Compact is much heavier at 137g, probably because of the glass back, but it's smaller, if a little fatter at 127 x 64.9 x 9.5mm. The chamfered edges and metal frame are going to invite obvious comparisons with the iPhone 5S which is significantly smaller, but not quite as svelte and only a tiny bit lighter at 123.8 x 58.6 x 7.6mm and 112g. Disappointingly, we're looking at a 4.7-inch Super AMOLED display in the Alpha with a resolution of 1280 x 720 pixels. This accounts for the larger height and width than its competitors, but still isn't the Full HD you'd be expecting on a high-end phone like this. In comparison, the Z1 Compact has a 4.3-inch display, the S5 Mini has a 4.5-inch screen, and the iPhone 5S has a 4-inch area to poke at. With the same resolution as the Alpha, but a smaller screen, the S5 Mini claims a higher pixel density at 326ppi, which is identical to the pixel density in the iPhone 5S. The Xperia Z1 Compact is the clear winner here with a ppi of 342, but you're unlikely to notice much of a difference given the smaller screen size. This is where Samsung has economized in its more diminutive phones in the past; for example the S5 Mini has a 1.4GHz quad-core with 1.5GB of RAM. Not so this time, as the Alpha is going to be offered in octa-core (1.8GHz and 1.3GHz) and 2.5GHz quad-core variants with 2GB of RAM. That's enough to eclipse the 2.2GHz quad-core processor in the Z1 Compact, also backed by 2GB and it blows the 1.3GHz dual-core iPhone 5S with a paltry 1GB of RAM out of the water. We're already hearing that the Alpha beats the S5 and HTC One M8 in benchmark tests, so while the screen sharpness is a let-down, the internals certainly aren't. You'll find a 12MP main camera in the Galaxy Alpha and a 2.1MP front-facing camera. It also boasts a good range of photography features including real-time HD, making it close to rivaling the Galaxy S5 in terms of specs, although not quite. The S5 Mini has a less impressive 8MP and 2.1MP combo, but the Xperia Z1 Compact wins the spec race with a 20.7MP main camera supported by a 2MP front-facing camera. The iPhone 5S lags way behind on paper in this category with an 8MP main camera and a 1.2MP front-facing shooter, but that doesn't take into account the real world performance, which has seen Apple's smartphone become one of the leading cameras on planet Earth due to its simplicity of use. They all have an LED flash and a range of software enhancements. The Alpha sounds decent, but we'll need a hands-on to do a meaningful comparison for the camera. We find something of a surprise in the battery department. The Alpha has a relatively small 1,860mAh battery when compared to the 2,100mAh battery in the S5 Mini and the 2,300mAh battery in the Z1 Compact. The iPhone 5S lags behind here too, with a 1,560mAh, but once again it's all about the real-world performance. With the biggest screen of the bunch, you could reasonably expect the Alpha to be packing a bit more power, but this could be one of the ways Samsung was able to make it so slim. Will that hurt it in the real world? Experience would suggest that it would, especially with the more powerful version of the phone. Samsung's clearly making an effort to aim this phone at those that care about design, but sadly it looks like it's at the expense of battery life. Naturally the Alpha comes with Samsung's full menu of apps, extra software features, and compatibility with its wearables range. It also inherits the fingerprint scanner and heart rate monitor from the S5, both of which are also present in the S5 Mini too. The heart rate monitor is in a different location than on the S5 though, which may present issues plugging your finger onto it. It lacks a micro SD card slot, but there is 32GB of internal storage. Unfortunately the dust and water resistance in the Z1 Compact (IP55/58) and the S5 Mini (IP67) are absent in the new Galaxy Alpha, as they are on the iPhone 5S. Do not throw that down the toilet. Samsung hasn't announced the pricing for the Alpha yet, but we won't be surprised if it's close to the £550 that a SIM-free iPhone 5S will cost you. It's a weird one, as it seems to be a cut-down version of the Galaxy S5 in some respects (camera, screen and battery for example) so will consumers be ready to pay more for metal when that can be had elsewhere for less? The Xperia Z1 Compact is significantly cheaper at £350 off-contract and the S5 Mini is a just a touch more than that at around £380. It's encouraging to see Samsung follow Sony's lead in the power department by matching flagship processor performance in the Alpha. The premium design and svelte form factor are also a welcome departure. But, we can't help being disappointed at the lack of water resistance and surprised by the omission of a micro SD card slot - and that battery size is a real worry. Everything else looks like par for the course, but we'll have to see how the camera and battery perform in the wild before making a real judgment. 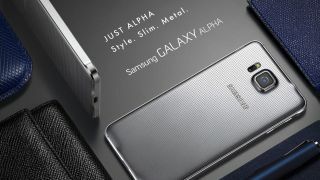 The Galaxy Alpha's prospects of success depend heavily on Samsung's pricing, and with a release date set for September, it won't be long before we get the chance to give it a go in the real world. Are microSD slots really needed any more?